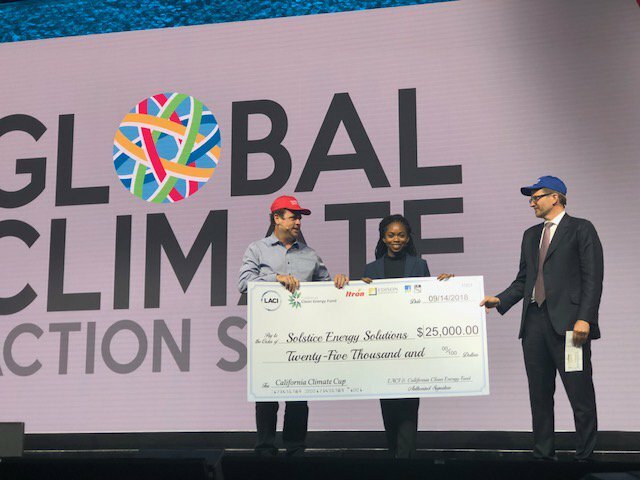 LOS ANGELES, CA – On September 14, The Los Angeles Cleantech Incubator (LACI) and California Clean Energy Fund announced the winner of the California Climate Cup on the Main Stage of the Global Climate Action Summit in San Francisco, CA. The California Climate Cup is a startup competition seeking the world’s most promising climate solutions for megacities and region. Ten competitors made it to the California Climate Cup finals held on September 10th from the US, Australia and France, and pitched their companies before a panel of judges representing Itron Idea Labs, Edison International, BMW i Ventures, Emerson Elemental, GreenBiz and Innovate UK. The top ten finalists were selected from over 100 applications in the areas of zero emissions mobility and goods movement, energy/transportation nexus, and digital solutions for sustainable cities. Find out more information about the 10 California Climate Cup Finalists here. Following the finals in Los Angeles, the three category winners, Wheeli, EVmatch and Solstice Energy Solutions, attended several events in San Francisco pitching in front of key customers, investors, global leaders and policymakers, culminating the Grand Prize presentation at the Moscone Center on Friday, September 14th. Solstice Energy Solutions was awarded $25,000US and the two category finalists were awarded $5,000US. The competition was supported by major sponsors Edison International and Itron Idea Labs. Additional sponsorship was offered by PG&E and LADWP and affiliate partner support was provided by C40 and GreenBiz / VERGE. Solstice Energy Solutions emerged as the first event California Climate Cup grand prize winner. The San Francisco-based company develops IoT and software to intelligently manage distributed energy resources. Its initial focus is on cities in emerging markets where unreliable grids have resulted in distributed energy landscapes, primarily diesel generators. Increasing integration of distributed solar and battery technology ultimately requires intelligence, flexibility and control. Wheeli is a new York-based shared mobility company. Wheeli is the carpooling app for college students working to build a national transportation network starting with college campuses. Wheeli is the Airbnb for the empty car seats on the road. EVmatch from Santa Barbara, California provides people a network of electric vehicle charging stations. EVmatch is a peer-to-peer network for electric vehicle (EV) charging that harnesses the power of sharing to immediately create more reliable charging options. Through EVmatch, individuals and business owners rent out their private charging stations, earning money and supporting EV drivers with reservable charging. EV drivers leverage the sharing economy to easily find, reserve, and pay for charging with a few quick clicks using the company’s web or mobile applications. Los Angeles Cleantech Incubator (LACI) is a private non-profit organization helping to accelerate the commercialization of clean technologies and ensuring an inclusive green economy by unlocking innovation, transforming markets and enhancing community. Founded as a cluster-driven economic development initiative by the City of Los Angeles and its Department of Water & Power (LADWP), LACI is recognized as one of the most innovative business incubators in the world by UBI. In the past six years, LACI has helped 72 portfolio companies raise $159M in funding, $220M in revenue, create 1,695 jobs, and deliver more than $379M in long-term economic value. LACI is an Equal Opportunity Employer (EOE) and committed to building a more inclusive ecosystem that integrates women, people of color, and other underrepresented groups into the cleantech sector and the overall tech industry. We strongly encourage applications from qualified applicants and members of underrepresented groups. The information collected from the application helps us ensure that we are meeting our goal of an equitable and diverse campus and community.